Besides sharing a little more of my testimony with you in this post, I will also be sharing some information with you that I found while doing further research over this past month (April) concerning Mary the mother of Jesus as taught by the Catholic church, as well as some other information that I found last year. I will be sharing the teachings of the Catholic church with you in much greater detail concerning Mary in Part 3, as well as sharing some of the teachings of the Catholic Church concerning the Sacrifice of the Mass, purgatory, some of the ‘Canons and Decrees of the Council of Trent,’ information from ‘Vatican II,’ and also information directly from the book, ‘Catechism of the Catholic Church’ which I purchased last year. I will then share many Scriptures with you from an exact copy of the Catholic New Testament that God used to reveal the truth to me back in 1980 and will compare the teachings of the Catholic church to God’s Word with the hope that many of you who are Catholic will read those Scriptures and come to the knowledge of the truth. Unless otherwise noted, all the verses I will be using in this post will be from my copy of the Catholic New Testament. In this post, however, I just wanted to touch on a few important points to show you how Catholicism places much more emphasis on Mary than they do on Jesus, and therefore precious Catholics never come to the understanding of what Jesus actually accomplished through His sinless life and His death and resurrection. Even as I am writing this I am praying for all Catholics, and especially for those Catholics who may come across this post and other posts on my site; I am asking and trusting that God has already drawn them to Himself and that He will one day give them eyes to see the glorious ‘good news’ of the gospel that is clearly revealed in Scripture, but hidden by some of the twisted teachings of Roman Catholicism. I don’t want to offend any of you who are Catholic by saying that, but when you read all the information below, as well as all the information I will be sharing in Part 3, I hope you will then realize why I left the Catholic church, and that the reason I am sharing all this information is out of concern for you so that you might come to know the true gospel and understand what the Catholic church actually teaches. While doing this research much of the information that I found filled me with a deep sadness and a righteous anger because of how the complete atoning work of Christ on the cross has been perverted in so many ways by some of the teachings of the Catholic church. However, God used all this new information that I have learned to give me an even deeper love and appreciation for what Jesus did when He died in my place on the cross, and I am so very thankful that He so graciously chose to reveal the truth to me through His Word! Finding the disturbing information that you will see below also gave me a stronger desire to “earnestly contend for the faith that was once for all entrusted to the saints,” (Jude 3) and intensified my desire to share Biblical truth with Catholics. My prayer is that God has already prepared the hearts and minds of many Catholics, as well as any person who will find their way to this site. 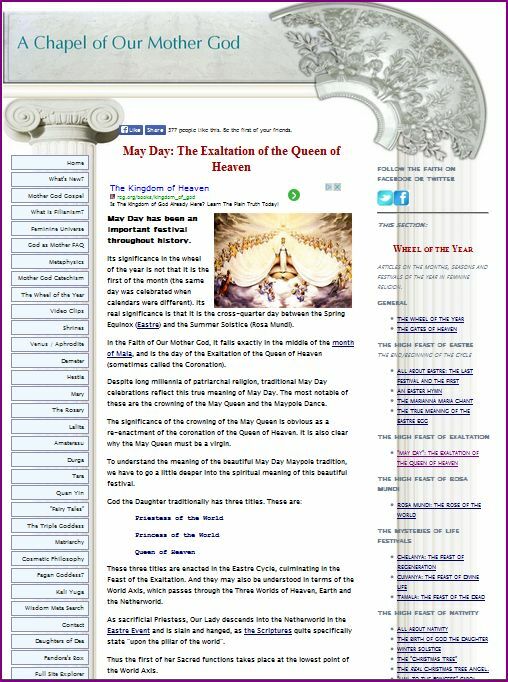 And even though some of you may be offended by some of the information you may read here, I pray you will each realize that all the information I share with you on my site I share out of love and concern for you because I don’t want anyone to be deceived; for your eternal destiny depends upon what — or who — you place your trust in for your salvation. A true Christian follows Christ, not a man or a religion. As I shared with you in Part 1, ‘I had tried all that was humanly possible to try and make my marriage work.’ And what I forgot to include in Part 1 — which I will share with you now — is that in less than 2 years after we were married, I gave birth to a beautiful baby girl, whom my ‘husband’ proudly showed off to all his friends when I’d bring her with to many of his baseball games. He would completely ignore me, and would just talk to my daughter telling her how pretty she was, and I must confess to you that sometimes I found myself feeling jealous and even envious of my own precious daughter during the first year after she was born! Fatherhood did not cause him to change his priorities either; he continued to go out with his friends and involve himself in either playing or watching the sport of each season as they came, and would leave me home with my daughter most of the time. When I gave birth to our precious son a few years later, I was hoping that then my ‘husband’ would finally love me because he was hoping for a son. But as delighted as he was that he now had a son, his feelings and behavior towards me did not change. (Let that be a lesson to any of you out there if you believe that having a child will finally make your husband love you! I did not personally try to have a child with that thought in mind; both of my children were complete and delightful surprises to me). Though all children are gifts from God, I clearly see that my daughter and son were gifts from God, because both of them gave me joy, love, and a reason to live in the midst of the deep and overwhelming sadness and rejection that I was feeling because of how my ‘husband’ was treating me. Oftentimes I would pick up my sweet daughter whom I loved with all my heart, and I would walk around the house and hold her close as I talked to her. I made up a word for these special times and referred to them as ‘wuggies; a combination of ‘walks’ and ‘hugs.’ Though she was four years old when my precious son was born, these special times continued for a while longer. I tried to carry on with this new tradition with my son, but when he got a little older he would usually squirm around just wanting to be put into his bed so he could go right to sleep. Though I was deeply depressed in my marriage before I became a Christian, I never became suicidal. Suicide and divorce were never (and never will be) acceptable (or Biblical) choices for me to even consider in order to release me from painful circumstances that life can bring –no matter how devastating. I did, however, (as mentioned in Part 1) shut down emotionally because I lost all hope; I had tried all I knew to do to get my ‘husband’ to respond to me, and felt like I had exhausted every idea I could possibly think to try with the hope that he would then love me and allow me to be a part of his life. And after attempting to seek God through ‘my Catholic faith’ by going back to ‘confession’ in order to receive forgiveness from the priest for the sins I had committed over the many years since my last confession, all I ended up with was more guilt, as well as shame and an overwhelming feeling of hopelessness which led me into an even deeper state of depression. I was amazed at how the Book of Hebrews focuses completely on Jesus, declaring Him to be “the radiance of God’s glory and the exact representation of His being…” (Hebrews 1:3) And when I finished reading Hebrews — especially chapters 7 through 10 — God opened my eyes so that I could finally see the truth that Jesus death on the cross was sufficient to pay the debt for my sins in full! I now saw Jesus in a completely different light; I saw Him as strong and mighty and as the Victor instead of the ‘victim’ as the teachings of the Catholic church refer to Jesus during the ‘Sacrifice of the Mass.’ (I will go in much greater detail of the teachings of the ‘Sacrifice of the Mass’ in Part 3 of my testimony). “Therefore, O Lord, as we celebrate the memorial of the blessed Passion, the Resurrection from the dead, and the glorious Ascension into heaven of Christ your Son, our Lord, we your servants and your holy people, offer to your glorious majesty from the gifts that you have given us, this pure victim, this holy victim, this spotless victim, the holy Bread of eternal life and the Chalice of everlasting salvation. Be pleased to look upon these offerings with a serene and kindly countenance, and to accept them, as once you were pleased to accept the gifts of your servant Abel the just, the sacrifice of Abraham, our father in the faith, and the offering of your high priest Melchizedek, a holy sacrifice, a spotless victim.“ (Emphasis in red is mine). So, with that strong desire in my heart to reach Catholics, I gathered a large amount of tracts entitled, ‘How A Roman Catholic Can Be Sure Of Heaven,’ and for one last time I went back to the Catholic church I had attended for many years at a time when I knew many people would be in church for Mass. I quickly ran around the parking lot praying for the people and placing a tract under the windshield wipers of each car in the parking lot. And just as I was finishing, the people started coming out to their cars to find the tract with the life giving ‘good news’ of the gospel that they sadly had never heard before. I left there trusting that ‘God’s Word would not return void but would accomplish what He sent it to do’ (Isaiah 55) in the hearts and minds of those who would read it. I now found myself determined to dig even deeper in order to find the truth concerning all that the Catholic church actually teaches. So with a Catholic Douay Version Bible, as well as the little Catholic New Testament Bible that I amazingly received from my ‘husband,’ along with information about Vatican ll and the Council of Trent, I sat down and earnestly prayed for God to show me the whole truth as I began reading through all the information. In other words, an ‘indulgence’ allows you to earn time off from the time you may have to spend in the purifying fires of ‘purgatory,’ though no one has any way of knowing how long one may have to stay there. Are you now beginning to see how the teachings of the Catholic church take away from the sufficiency of Christ’s atoning work on the cross and His death and resurrection? “The church, inspired by the Holy Ghost, has established a special feast in honor of the Most Precious Blood of Our Lord. This saving blood was first shed at the circumcision of the divine Infant; it was next poured out in the bloody sweat of agony in the Garden of Olives; again it flowed under the cruel blows of the savage soldiery; then when the crown of thorns was pressed into His temples; and finally when “one of the soldiers with a spear opened His side and there came out blood and water.” St. Augustine, explaining these words of St. John, points out that the Evangelist does not use the words struck or wounded but says distinctly, “one of the soldiers with a spear opened His side,” that we may understand thereby that the gate of life was opened, and from that sacred side issued all those sacraments of the Church without which we can never hope to gain eternal life. This precious blood was symbolized by the victim of the Old Law; but while these latter sacrifices served only to purify the outer man, the blood of Jesus Christ, by virtue of its infinite efficacy, washes us free from all sin, provided we avail ourselves of the means established by our divine Saviour in His Church for the application of its infinite merits. (Emphasis in red is mine). “Wherefore it must be recognised that the sacred writings are wrapt in a certain religious obscurity, and that no one can enter into their interior without a guide; God so disposing, as the Holy Fathers commonly teach, in order that men may investigate them with greater ardour and earnestness, and that what is attained with difficulty may sink more deeply into the mind and heart; and, most of all that they may understand that God has delivered the Holy Scriptures to the Church, and that in reading and making use of His Word, they must follow the Church as their guide and their teacher. St. Irenaeus long since laid down, that where the charismata of God were, there the truth was to be learnt, and that Holy Scripture was safely interpreted by those who had the Apostolic succession. His teaching, and that of other Holy Fathers, is taken up by the Council of the Vatican, which, in the renewing of the decree of Trent, declares its “mind” to be this–that “in things of faith and morals, belonging to the building up of Christian doctrine, that is to be considered the true sense of Holy Scripture which has been held and is held by our Holy Mother the Church whose place it is to judge of the true sense and interpretation of the Scriptures; and therefore that it is permitted to no one to interpret Holy Scripture against such sense or also against the unanimous agreement of the Fathers.” (Emphasis in red is mine). Even though the Roman Catholic church definitely teaches the deity of Christ, they place much more emphasis on Mary than they do on Jesus; Jesus was always being sacrificed during the Mass, always hanging on the cross, and only presented to us clearly as the Risen Savior on Easter. 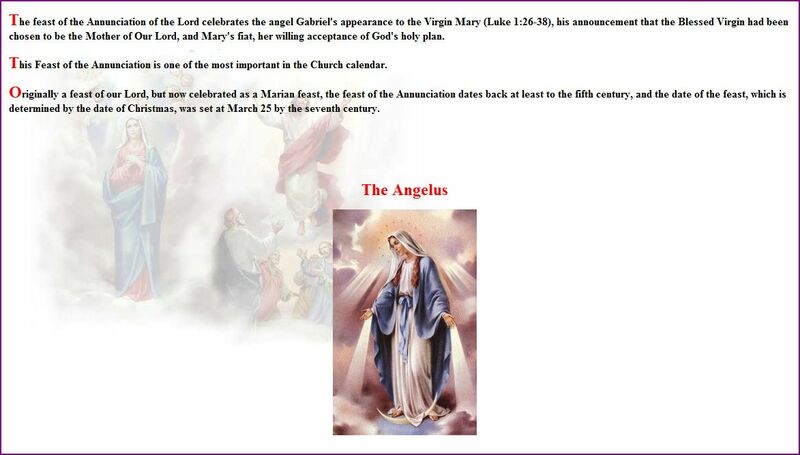 In Roman Catholicism, the month of May is always dedicated to Mary. During this time there is what’s called a ‘May crowning,’ where there is a procession of children walking into church, and a girl would be chosen to place a crown of flowers upon the head of the statue of Mary. Many songs are sung about Mary and to Mary. “Mary, whose glory we proclaim today, was a humble servant of the Lord when she was on earth. With Him and under Him she was an instrument in our redemption. Now, in the glory of heaven she is still the God-bearer to Christ’s brothers and sisters. She cares about us. She is the minister of holiness and the queen of love.” (Emphasis in red is mine). 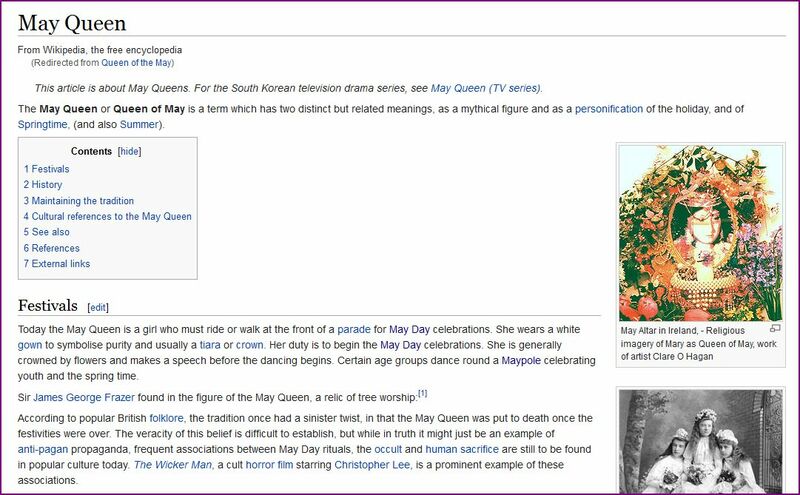 If you watched the video I posted above, entitled, ‘May Crowning and Maypole Dance,’ then you saw how the girl who was chosen as the ‘May Queen’ wore a crown of flowers and made a speech before the dancing began,’ just as it describes above. And I remember when I was young and our whole school class would celebrate the ‘May Crowning of the Virgin Mary,’ each girl would wear their ‘white communion gown and ‘a tiara or crown’ on their heads, also as described above. But as disturbing as it is to see how these pagan rituals have been ‘Christianized’ and although I never took part in a Maypole dance and never even remember us ever having one at the Catholic church that I attended as a child, I did take part in many ‘May crownings,’ and find it extremely disturbing to see how Mary is receiving such adoration when Jesus Christ alone is deserving of our adoration! The most blessed Virgin Mary was, from the first moment of her conception, by a singular grace and privilege of almighty God and by the virtue of the merits of Jesus Christ, Savior of the human race, preserved immune from all stain of original sin. 493 “The Fathers of the Eastern tradition call the Mother of God “the All-Holy” (Panagia) and celebrate her as “free from any stain of sin, as though fashioned by the Holy Spirit and formed as a new creature.” By the grace of God Mary remained free of every personal sin her whole life long.” (Emphasis in red ink is mine). 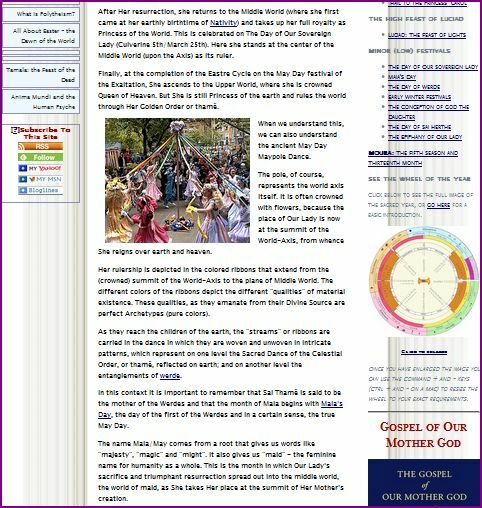 After discovering there was a connection between the ‘May Crowning of the Virgin Mary‘ and the ‘May Pole dance,’ and how the ‘May Pole dance‘ is the pagan ‘Celebration of Spring,’ I then decided to dig a little deeper by doing a little more research on ‘May Day‘ celebrations and came across the following startling information on Tuesday which I ‘quick captured’ for you below: ‘A Chapel of Our Mother God.’ This was enough to confirm to me — and I believe will clearly show you, as well — how the ‘Queen of Heaven’ — a title often given to the Mary of Catholicism — is someone other than the Mary of the Bible. 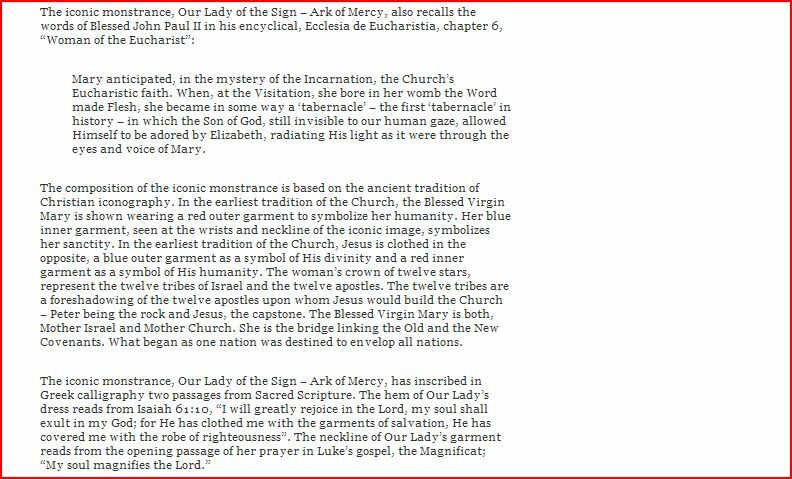 And yet some of the similarities to the Mary of Catholicism are not coincidental. After reading the above article, my heart became burdened for the writer at this site and all the people who are involved in these types of pagan religions, because if those of us who are true Bible believing Christians were exalting Christ the way we should be doing by sharing who Jesus Christ is and what He accomplished when He died in our place on the cross and rose again with all the people that God allows to cross our path in life, there wouldn’t be so many people lost and wandering and finding their way into paganism and exalting pagan goddesses! My heart also became even more burdened to reach Catholics because I want them to come to the realization that it’s Jesus who deserves all their praise and honor and only He is worthy to be exalted! The humble and obedient virgin Mary gave birth to Jesus, but our salvation came through Christ alone from start to finish! “After Her resurrection, she returns to the Middle World (where she first came at Her earthly birthtime of Nativity) and takes up Her full royalty as Princess of the World. This is celebrated on the Day of Our Sovereign Lady (Culverine 5th/March 25th). Are you now beginning to realize the seriousness of this information? The unveiling of this ‘iconic monstrance‘ took place on May 31, 2008, and they are still seeking to raise the funds for the sanctuary. The amount needed for the building for the sanctuary that will house this monstrance is estimated to cost between 15 and 20 million dollars! 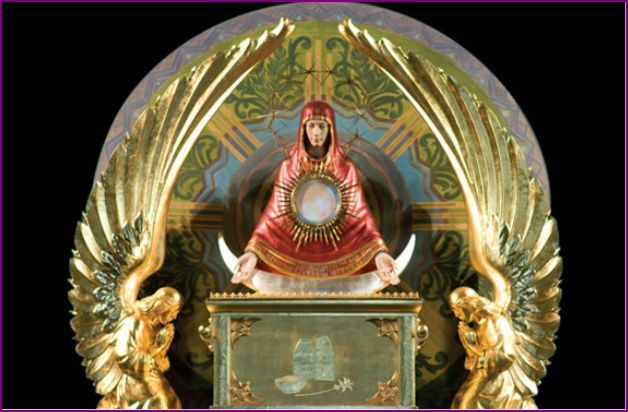 (I may add some more comments concerning this ‘iconic monstrance‘ when time allows). Granted, the angels/cherubim are not “one piece with the cover” as God’s Word commanded the ark of the covenant to be made, but the cherubim are facing each other looking toward the cover. 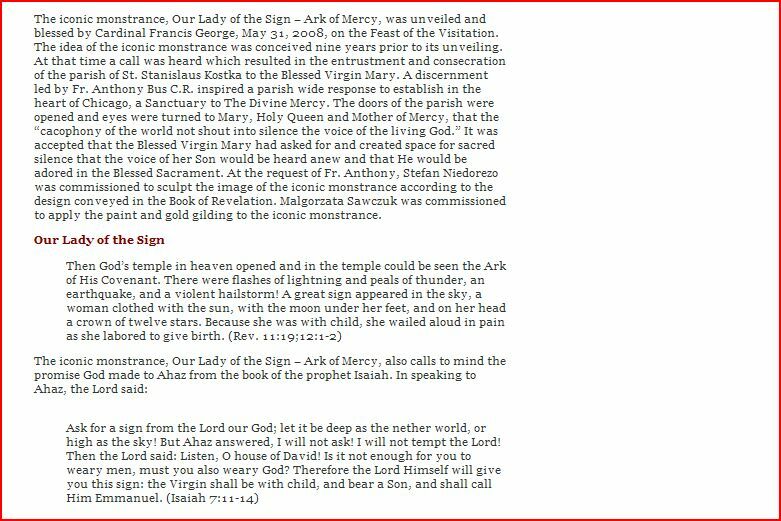 And the most disturbing and even blasphemous thing of all, is the fact that Mary is seated between the cherubim, exactly where God said He would manifest His presence! 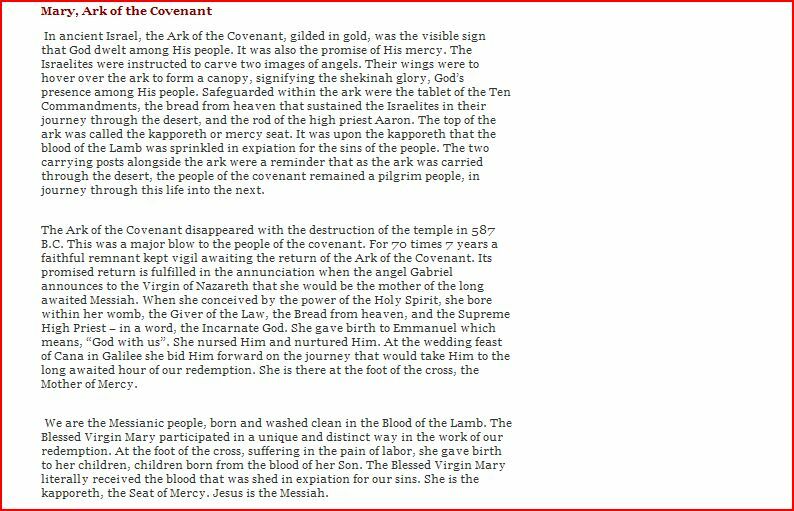 And although the Catholic church tries to explain why they believe ‘Mary is the Ark of the New Covenant,’ you will see through the information in this post and what I will share (Lord willing) with you in Part 3, that they are attempting to elevate Mary further than some of you could ever imagine! IS MARY THE WOMAN IN REVELATION 12 AS THE CATHOLIC CHURCH CLAIMS? In this post I have tried to demonstrate to you how, in Catholicism, Mary is being elevated to a position where only Jesus Christ should be, and Jesus Christ — the one and only Son of God who alone lived a sinless life and is King of kings and Lord of lords, and God in the flesh who conquered sin and death — has been reduced to being continually sacrificed again and again, day after day on the altars in Catholic churches around the world, thus denying His death as having been sufficient to atone for our sins. Lord willing, Part 3 I will go into much greater detail to show you from the Catholic Church’s own teachings what they believe about Mary to make my statement about Mary clear to you. I am no longer bitter or angry; the truth that God revealed to me through His Word has filled me with compassion for Catholics, as well as for all those who have been deceived by false teachings. And I have a deep love for God’s Word and the gospel that alone has the power to set a person free. I am saved by grace alone, through faith alone, in Jesus Christ alone. When I believed the good news of the gospel and repented of my sins, I became a new creation (2 Corinthians 5:17); God transformed my mind, healed my broken heart, and has used all I have been through to become a Berean (Acts 17:11) ;ever since He opened my eyes to the truth in His Word so that I could see the glorious news of who Jesus really is and what He accomplished, I have continually tested all I hear (and read and see) in light of Scripture so that I will never be deceived again! Imprimatur: John Francis Wheaton, S.T.I., S.S.L. ‘DOES ROMAN CATHOLICISM TEACH ANOTHER GOSPEL? DEBATE BETWEEN LARRY WESSELS AND ROBERT FASTIGGI.’ PART 1 and 2. A very informative debate, and definitely not boring! For the most shocking information concerning the Catholic church, (although I personally think the ‘Iconic Monstrance’ is extremely shocking) I will end with these two videos that I just found last year as I was searching for information to add to this post. The first one features eye-opening pictures taken in the Vatican itself that will leave you stunned and wondering just what is the purpose for the supposed ‘One true Church’ in having such things! Please pray for discernment and wisdom, and also ask God to reveal the truth to you before you watch. (UPDATE 4-26-14: Upon finding out that the video I originally posted below was defective, I now replaced it with one that plays completely to the end. I’m sorry for not realizing it was defective when I originally posted it). In this last video series , Doc Marquis, a former Luciferian witch who is now a Christian, draws many parallels between the occult practices he was once a part of, and the rituals in the Catholic church. He shows many detailed pictures, as well as reads many Scriptures to prove his points. As he does, he shares the truth lovingly, because his desire is to see many Catholics come to see through the deceptive teachings of the Catholic church so that they will realize that Jesus’ death was sufficient to pay the debt for our sins in full! That’s also my main reason for sharing my testimony with all of you. 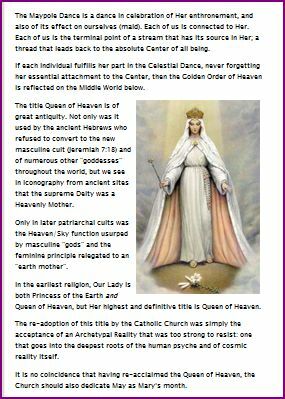 In this series, Doc Marquis also shares the teachings of Roman Catholicism concerning Mary the mother of Jesus, and compares them with the teachings of the ancient Babylonian religion. Once you see the parallels it will confirm in greater detail what you discovered if you watched the ‘Messages From Heaven’ video. As I shared with you earlier in my ‘INTRODUCTION,’ in Part 3 of my testimony I will (Lord willing) be focusing completely on many doctrines of the Catholic church and will be sharing information with you directly from the ‘Catechism of the Catholic Church’ book that I purchased, as well as some of the teachings of Vatican II and the Council of Trent, and then share what God’s Word has to say from the Catholic New Testament that I was given, and will be praying that many of you will then clearly see the truth that God showed me in His Word. “Are you going to believe the Word of God? Or the word of man? I pray you will make the same choice that I did to believe the ‘Word of God,’ because your eternal destiny is at stake; there is no purgatory, therefore there is no second chance after death. I pray the day will come, O precious Catholic, when you will realize that Jesus paid your debt to sin in full and that there is nothing you can do to earn God’s love and forgiveness! 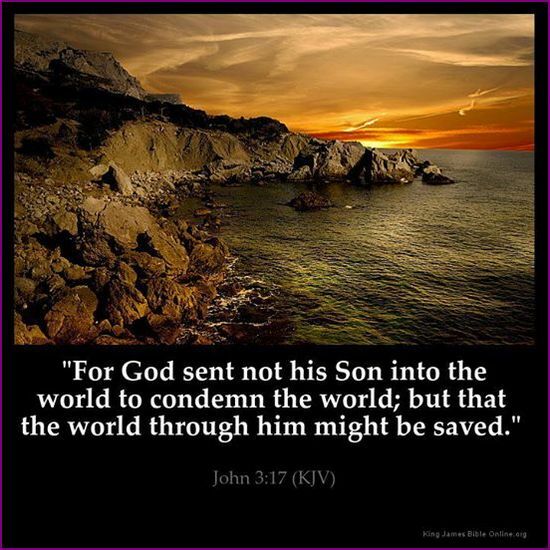 You simply place your complete trust in the finished work of Christ on the cross as full payment for your sins, make the choice to turn from your sin (repent) out of deep sorrow for your sins to show your decision to accept what Jesus has done for you. He will then break the hold that sin has upon your life, fill you with His Spirit, and give you the ability to obey Him which you will desire to do simply out of love and appreciation for what He has already done for you. “My sin, O, the bliss of this glorious thought! MY TESTIMONY: FROM FEAR AND UNCERTAINTY TO PEACE AND ASSURANCE — HOW GOD REVEALED THE TRUTH TO ME AS I WAS READING A CATHOLIC NEW TESTAMENT BIBLE (PART 3 OF 3) (Already completed).